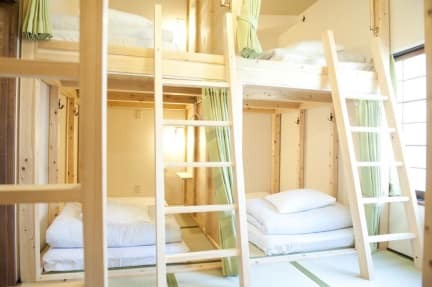 Osaka guesthouse midoriya is a small hostel which is renovated a more than 80 years old traditional Japanese house which was used for the washing and stretching of kimono. Location is near the Osaka-castle and in a quiet back street of an old part of Osaka where you can escape from the city bustle. How about spending a relaxing time and feel like staying at someone’s house. 1).《Check-in time: 16:00-22:00》You can drop your bags before check-in. If you want to do,please let us know in advance!! Hostel closed 11:00 to 16:00 for cleaning,if you come to hostel during a cleaning time, let us know in advance. Check-out time 8:00 to 11:00. You can check out before 8:00,Please let us know. You can leave your bags by free after check-out until 22:00. Cancellation contact after 22:00 is counted as the next day. 3).Our hostel is all the buildings smoking cessation. Please smoking at an outdoor appointed place. Please use the back side door 22:00PM～8:00AM, you can come in and out freely by PIN code(When you check-in, we tell you PIN code). 5).In the dormitory, the child who is lower than a primary schoolchild is impossible by the protector companion. 6).Our hostel is not a party hostel. Please make an appointment with the person liking drinking, and making noise at other hostel.